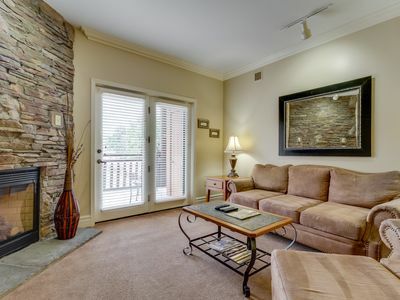 This is our personal condo and we strive to make your stay as relaxing and enjoyable as possible. You can call us at any time and we will help you in any way and as fast as possible. 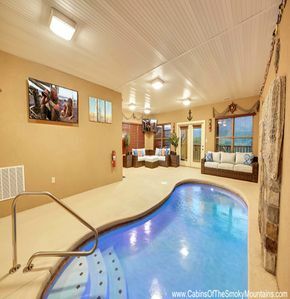 Check our calender and choose your days of relaxation and carefree adventure with us. I'm sure after one stay many more will follow. 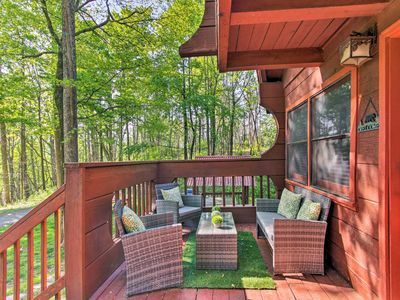 Bearadise is truly an atmosphere of beauty and relaxation. 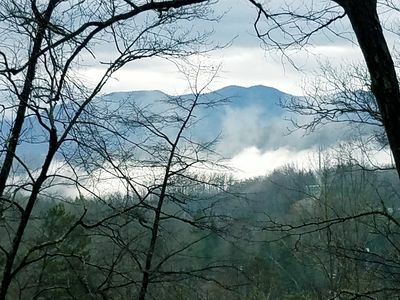 Bearadise borders the Great Smokey Mountain National Park and offers beauty year round that beckons you to return over and over. 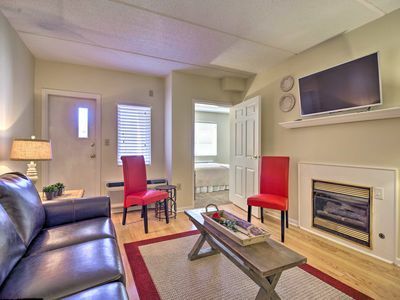 We offer tranquillity and beauty at an awesome value while you are only 10 minutes from the hustle and bustle of downtown action. 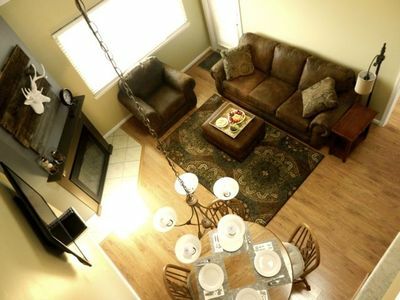 We pride ourselves in offering CLEAN, COMFORTABLE accomodations with touches of luxury and mountain atmosphere. 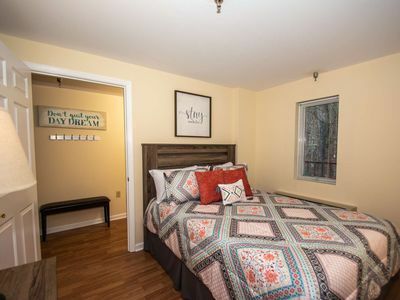 This is a 2 bedroom 2 bath unit with FREE WI-FI--ELECTRIC FIREPLACE--3 FLAT SCREEN TV'S--BLUE RAY PLAYER--NEWLY REMODELED-- NEW COMFORTABLE PILLOWTOP MATTRESS KING SIZE BED IN MASTER- PILLOWTOP QUEEN IN GUEST ROOM offer you a good night's sleep after a busy day. 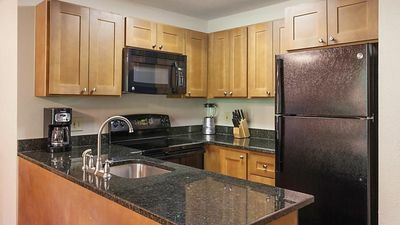 Coffee pot, frozen drink maker, blender, griddle for making those delicious pancakes, pots, pans,& all kitchen utensils, iron & ironing board, 2 hair dryers, microwave and board games. 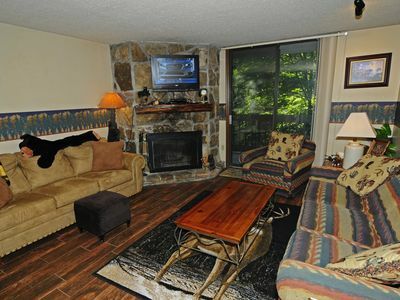 Window seat to sit and enjoy view of Mt LeConte full of extra blankets and pillows. 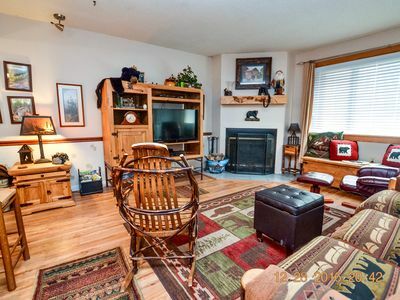 We have made this condo cozy & comfortable with cabin decor at a value price. 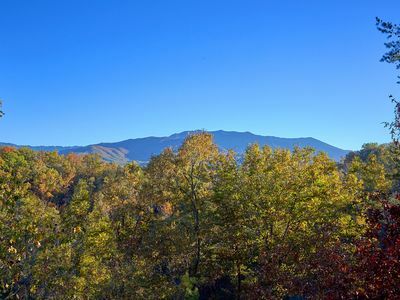 Just 3.5 miles from Gatlinburg and minutes from Ober Gatlinburg. 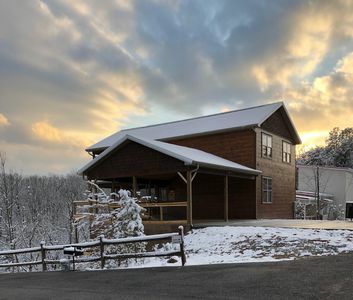 High Chalet is 3200 ft above Sea Level and is the highest complex in Tennessee. 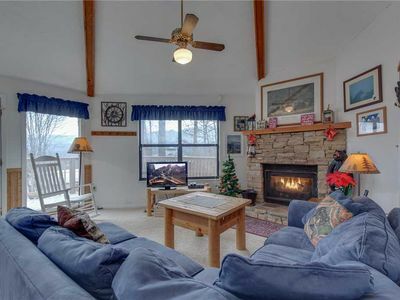 High Chalet ofers you a veiw of downtown lights as well as surrounding beauty of forest. You may catch a glimpse of numerous wild life in area. 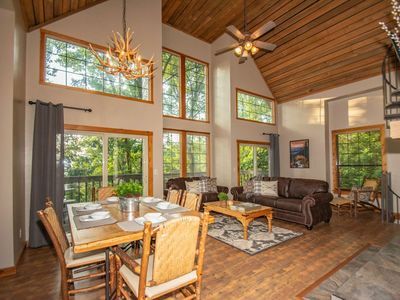 High Chalet has great outdoor areas including seasonal pool, 2 hot tubs, sauna, game room, picnic tables, gas grills with gas furnished, hiking trail and green areas. Lots of easy parking (free). 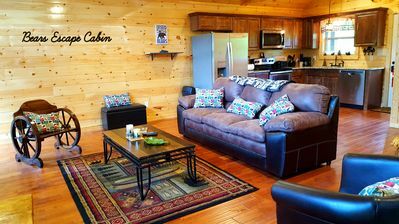 Apple Barn where you can shop and eat is located in Pigeon Forge as well as WalMart, Lowes & other chain stores. 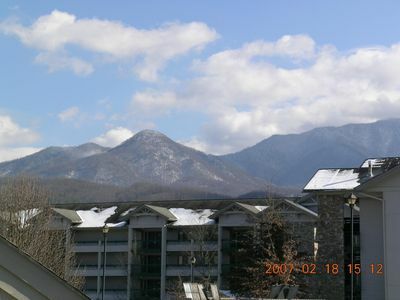 Downtown Gatlinburg offers quaint shops from candy to clothing as well as many restaurants and hillbilly golf. Downtown is perfect for walking and enjoying the ambiance. 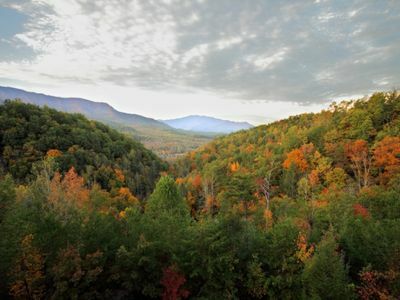 You can jump on a trolley to go to Pigeon Forge if you don't want to deal with driving so you can enjoy scenery. 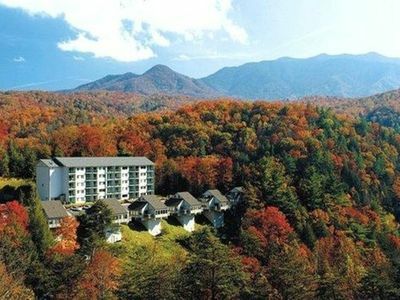 Ski Mountain Rd leads you to the edge of town to go into Great Smokey Mountain National Park & downtown Gatlinburg. Stop at Sugarland Welcome Center on your way into park to find information on all the hiking trails(one of our favorite things to do). This is a NON SMOKING unit. 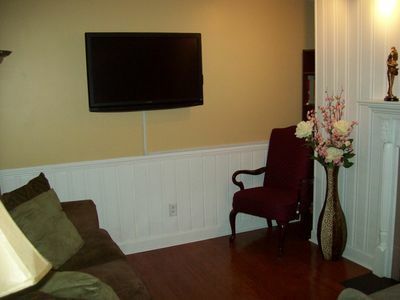 Smoking in this unit will result in loss of deposit and additional charge for professional deodorizing of unit . 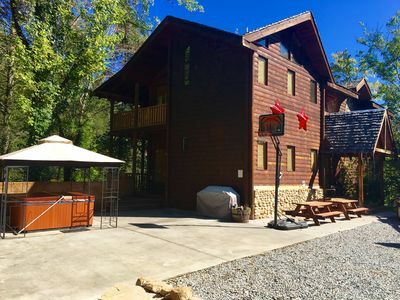 Gatlinburg Cabin w/ Private Hot Tub & Fire Pit! 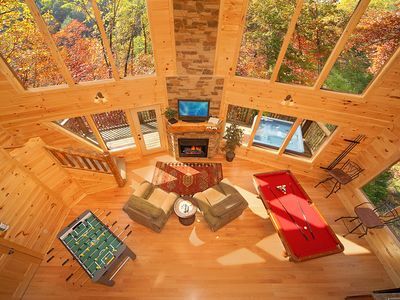 New custom-built cabin with an unbelievable view of the Great Smoky Mountains!